Admiral Cornwell joins Discovery in a dangerous attempt to infiltrate the headquarters of Section 31, unaware of a mole that is in their midst. Meanwhile Burnham's efforts to help Spock are rebuffed. Last edited by GateWorld; March 14th, 2019 at 10:58 PM. Wow, that ending was tough to watch. There was so much that could have been explored with Airiam still. But she was still magnificent for this episode. We got so much about her in one go that it still feels like a heavy loss. It’s safe to say that the big threat to organic life is now a sentient version of Control. In a lot of ways this goes towards explaining why more advanced data networks and AI are not really a thing in later shows. Potentially even why TOS seems so relatively low tech when it comes to computerisation. They literally will end up having to start at square one. Which is doubly interesting if that is something that they have to deal with the fallout for in season 3. I am a little more concerned now that it appears more and more that Burnham is the Red Angel, or might be based on what Airiam said but given Spocks psychological breakdown of her that would make sense. As much as I love Discovery their twists and turns last season were a bit obvious so hopefully they’ll pull the rug from under us this year. It also gives no answers for where the technology of the Red Angel comes from or what the Red Bursts are. If it does have anything to do with this Project Daedalus then that leads me to think that perhaps Section 31 or Control have at some point stolen technology from the future at some opportune moment. Either way this hasn’t changed my view that this is all a closed time loop. If COntrol was behind Airiam then that must mean that the corrupting program was on that future probe, in which case the time rift was still and instigating event, yet we do not know why that rift suddenly appeared. I thought anything after last week was going to be a letdown....but instead this was a total pivot to something else. I never expected to feel such sympathy for a character whose actor, really, is only able to communicate emotion to the audience through the pitch & tone of her voice--certainly, body language and facial expressions were totally off the table for her. Really quite something. That station is an abomination and should be destroyed. That’s my theory. The upcoming Section 31 show is supposed to be about how they became the organisation we see in the 24th Century but I’d be surprised if we don’t see the start of that here. Loved the ''smart mines'' scenes and the S31 outpost, looked pretty dope. But apart from that, maybe I've grown used to sudden deaths from GoT or TWD, but man that was SO obvious that the robot lady (Airiam?) was going to die in this episode. Way too obvious, when you give a character that barely has any screen time a whole dedicated episode it's clear as day that she's going down. I'm just a bit disappointed to have had my hand held through this episode, they did a much better job with Sarou which I thought was for sure going to die in his episode. Felt like Airiam was a Final Five and went full Cylon trying to hack into the mainframe. I definitely felt like it was a strong possibility at the start of the ep but I really hoped it wouldn’t happen. I still hope they’ll save her somehow (she is a cyborg afterall). In most shows when they pull that kind of stunt it feels so cheap but in this one they did so much to make us love Airiam. Like the friendship between her, Tilly, Detmer and Owo didn’t feel like it came out of no where since we have seen them work together. 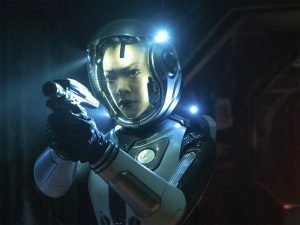 We’ve seen Tilly say that she’s been working with Airiam and we know that she is primarily on the bridge so of course she’d often work and have opportunity to get close to Detmer, Owo and Bryce. And the actress put so much into it. You could hear how fond she is of her comrades and the desperation in her voice. It really hurt by the end, to me at least. Unfortunately I have read some spoilers, so I knew where the end is going. But the whole episode was so amazing. Well written and played again. This show is really great and I can only hope more and more people will discover Discovery.